MTM2.com • View topic - Binedit error. Can anyone help me out with this? All my files are 256 x 265 and are RAW files. Good Luck to Lindsey Weenk and the Built Ford Tough Blue Thunder in 08-09! Post subject: Re: Binedit error. All my files are 256 x 265 and are RAW files. All my files ARE 256x256. and..? What about the preferences? Whenever a file's text shows up in red in binedit as in your graphic above it means there's a problem. Usually it's because binedit cannot find it so be sure it's in the correct 'art' folder that binedit looks in (check preferences). 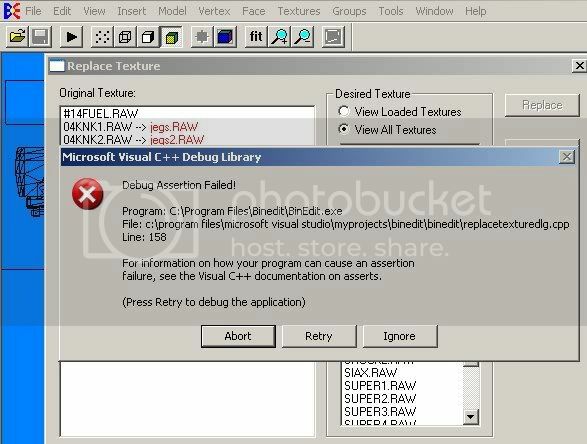 Double check that the raw is in fact 256x256 or 64x64, anything else will not work in mtm even if it's off by one pixel.